A sprain is damage to or tearing of ligaments or a joint capsule. A strain refers to damage to or tearing of a muscle. When excessive force is applied to a joint, the ligaments that hold the bones together may be torn or damaged. This action results in a sprain, and its seriousness depends on how badly the ligaments are torn. Any joint can be sprained, but the most frequently injured joints are the ankle, knee, and finger. Strains are tears in the muscle. Sometimes called pulled muscles, they usually occur because of overexertion or improper lifting techniques. Straining the muscles of the back is common. Sprains and strains are common. Anyone can have them. Children under age eight are less likely to have sprains than are older people. Children's ligaments are tighter, and their bones are more apt to break before a ligament tears. People who are active in sports suffer more strains and sprains than less active people. However, being overweight and generally inactive also increases the chance of developing a strain or sprain. Repeated sprains in the same joint make the joint less stable and more prone to future sprains. Any unfamiliar activity that stresses a muscle or joint may cause a strain or sprain. Heavy lifting, falls, and playing a sport without warming up or conditioning are common causes. There are three grades of sprains. Grade I sprains are mild injuries in which there is no tearing of the ligament and no joint function is lost, although there may be tenderness and slight swelling. Grade II sprains are caused by a partial tear in the ligament. These sprains are characterized by obvious swelling, extensive bruising, pain , difficulty bearing weight, and reduced function of the joint. Grade III, or third degree, sprains are caused by complete tearing of the ligament where there is severe pain, loss of joint function, widespread swelling and bruising, and the inability to bear weight. These symptoms are similar to those of bone fractures . Strains can range from mild muscle stiffness to great soreness. Strains result from overuse of muscles, improper use of the muscles, or as the result of injury in another part of the body when the body compensates for pain by altering the way it moves. Parents should call the doctor if their child experiences intense pain and swelling that does not improve within 24 to 48 hours; if their child cannot bear weight on the joint; if the child cannot use the muscle at all; or if there is a popping sensation in the joint when it is moved. Grade I sprains and mild strains are usually self-diagnosed. Grade II and III sprains are often seen by a physician, who x rays the area to differentiate between a sprain and a fracture. An MRI may be done to look for ruptured ligaments in a joint. Grade I sprains and mild strains can be treated at home. Basic first aid for sprains consists of RICE: Rest; Ice for 48 hours; Compression (wrapping in an elastic bandage); and Elevation of the sprain above the level of the heart. Over-the-counter pain medication such as acetaminophen (Tylenol) or ibuprofen (Motrin) can be taken for pain. In addition to RICE, people with grade II and grade III sprains in the ankle or knee often need to use crutches until the sprains have healed enough to bear weight. Sometimes, physical therapy or home exercises are needed to restore the strength and flexibility of the joint. 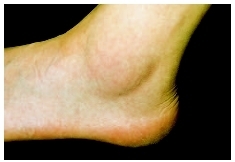 Swelling is a symptom of a sprained ankle. are the most likely candidates for surgery, especially with grade III knee sprains. For complete healing, physical therapy usually follows surgery. Alternative practitioners endorse RICE and conventional treatments. In addition, nutritional therapists recommend vitamin C and bioflavonoids to supplement a diet high in whole grains, fresh fruits, and vegetables. Anti-inflammatories such as bromelain (a proteolytic enzyme from pineapples) and tumeric ( Curcuma longa ) may also be helpful. The homeopathic remedy arnica ( Arnica montana ) may be used initially for a few days, followed by ruta ( Ruta graveolens ) for joint-related injuries or Rhus toxicodendron for muscle-related injuries. If surgery is needed, alternative practitioners can recommend pre- and post-surgical therapies that enhance healing. Moderate sprains heal within two to four weeks, but it can take months to recover from severe ligament tears. Until the early 2000s, tearing the ligaments of the knee meant the end to an athlete's career. Subsequent improved surgical and rehabilitative techniques offer the possibility of complete recovery. However, once a joint has been sprained, it never is as strong as it was before. Sprains and strains can be prevented by warming-up before exercising, using proper lifting techniques, wearing properly fitting shoes, and taping or bracing the joint. Parents should be aware that repeated spraining of a joint weakens it. It may be necessary for the child to do exercises to strengthen the joint after a serious sprain. Parents should allow plenty of time for strains and sprains to heal before allowing their child to return to strenuous athletics. DeLee, Jesse C., and David Drez. DeLee and Drez's Orthopaedic Sports Medicine , 2nd ed. Philadelphia: Saunders, 2003. Grayson, Charlotte. "Understanding Sprains and Strains—The Basics." WebMD , March 1, 2002. Available online at http://my.webmd.com/content/article/8/1680_54419.htm (accessed October 14, 2004). Wedro, Benjamin C. "Sprains and Strains." eMedicine Consumer Health , 2003. Available online at http://www.emedicinehealth.com/fulltext/5715.htm (accessed October 14, 2004).